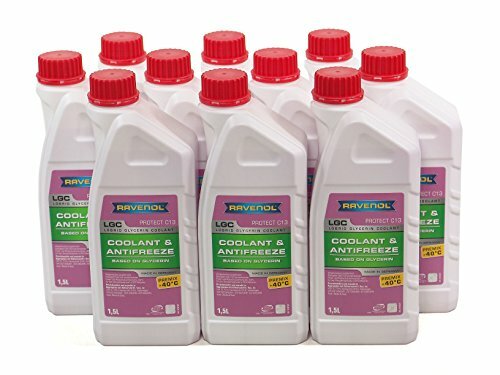 RAVENOL LGC Lobrid Glycerin Coolant Antifreeze Premix -40°C is an eco-friendly 1.2-Ethanediol (monoethylene glycol) based coolant with 20% glycerine additive for cooling circuits in combustion engines which provides maintenance-free corrosion and frost protection. This product is formulated based on a proven inhibitor development by combining glycerine and silicates with the organic additive technology OAT as an extended life coolant. The quality of an antifreeze is no longer just determined by the antifreeze effect (which automatically exists in an ethylene-glycol based product), but by the rust protection. That is why automakers subject antifreeze to lengthy corrosion and cavitation tests. RAVENOL LGC Lobrid Glycerin Coolant Premix -40°C protects the cooling system from corrosion, frost, and in the summer from overheating. RAVENOL LGC Premix -40°C is mixed with 50% deionized water to allow for a -40°C ready to use coolant. RAVENOL LGC Premix -40°C coolant also allows for perfect alkalinity of the coolant system. RAVENOL LGC Lobrid Glycerin Coolant Premix -40°C with frost and rust protection for year-round use in all aluminium engines. Use according to the mixing chart. Follow manufacturer's recommendations. Even in summer coolant must contain enough antifreeze to ensure good corrosion and overheating protection.